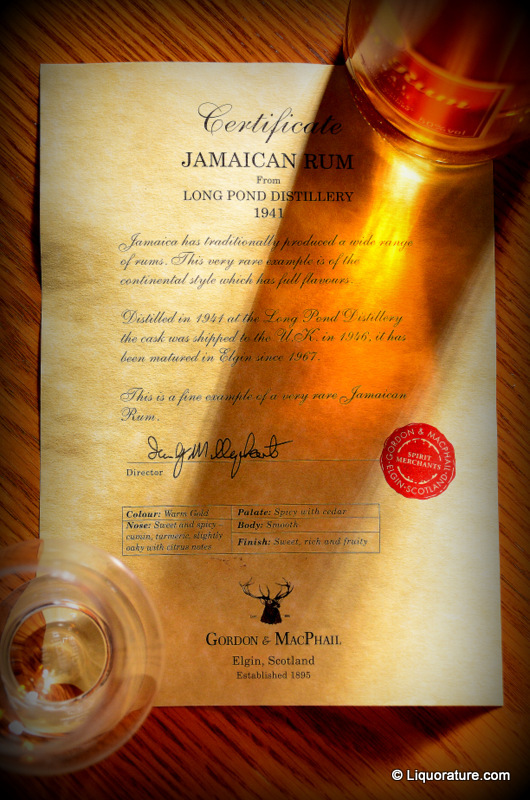 By now just about everyone knows that the Gordon and MacPhail Longpond 1941 58 year old walks and talks de Jamaican like a boss. 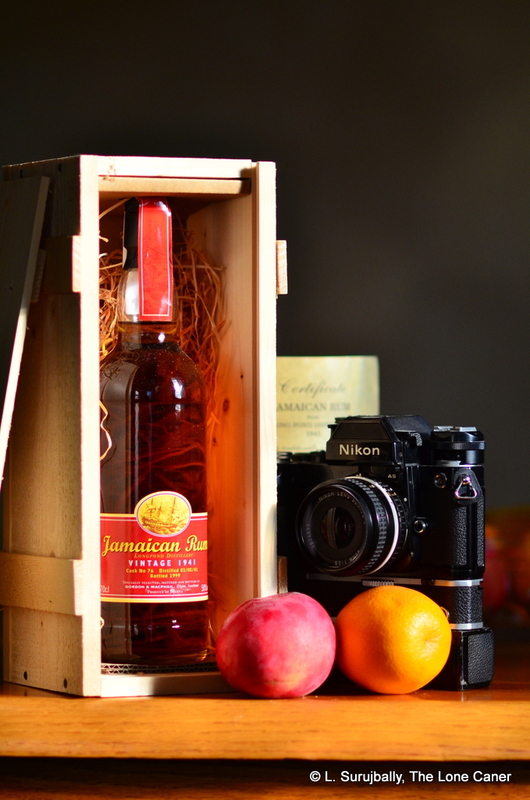 That thing gave super-aged rums a massive boost in visibility, showing that the patient, off-the-scale ageing of rums can be done with some care in Europe and come out at the other end with a profile that zooms to the top of the charts. I seriously doubt a tropical aged rum could survive that long without being reduced to a thimbleful, and rarely with such quality. Alas, the feat has almost never been replicated (except by Appleton with their 50 year old, the runner up). 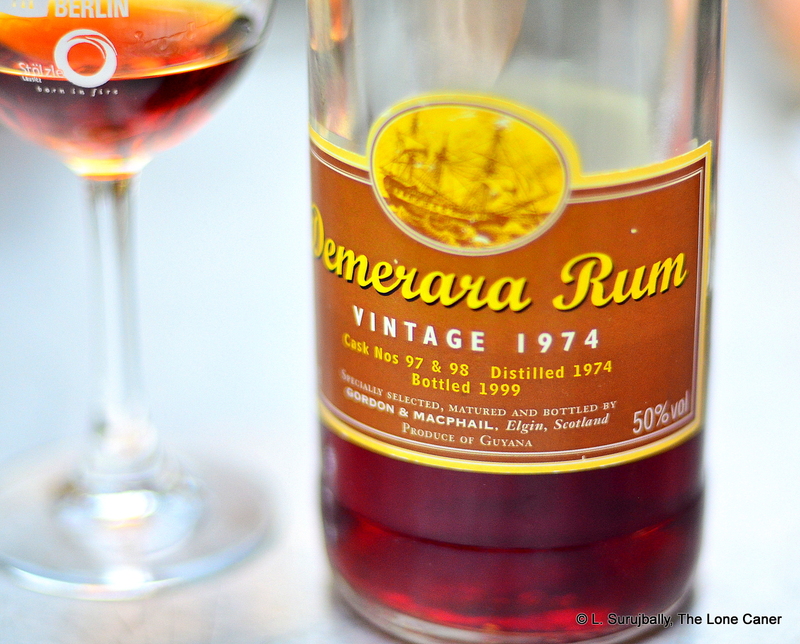 Still, G&M have done something pretty interesting with Demeraras as well, and as proof positive of the statement, I offer the much younger Demerara Vintage Rum, which was brought into the world in that excellent decade of the 1970s…1974 in this case (the years 1972-1975 were really stellar ones for rum production by the indies). This rum is bottled at 50%, is 25 years old, and is a triumph of continental ageing of any stripe, and of Demeraras in particular, even though we actually have no information as to which specific still(s) it came from. Never mind that, though. If you are one of the fortunate few who can pick up a glass of this ambrosia, take a deep smell, which you can because it is deep and dark and rich and troubles the snoot not at all. Was it a PM? An Enmore? The savalle? I thought the former somewhat more likely, because although it was rather soft in the attack (much less so than a Port Mourant might have been when it arrives with all guns blazing), it conforms to much of the profile I’ve come to associate with that still. 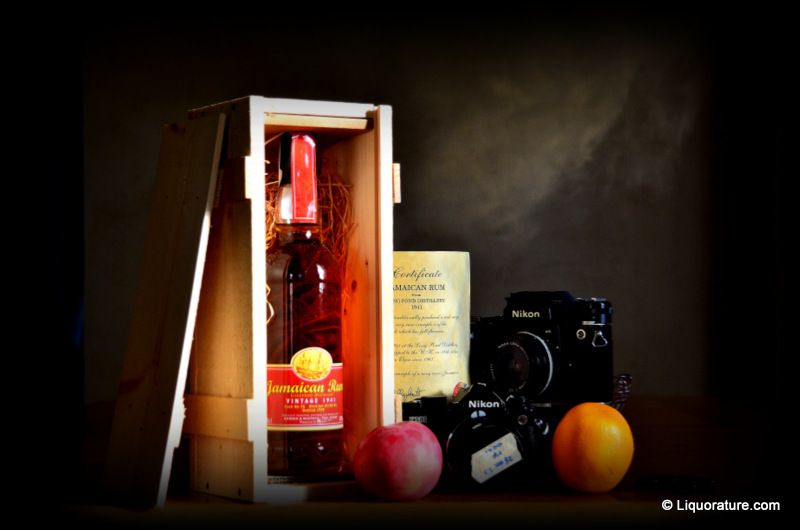 Anise, dark fruitcake, coconut shavings, prunes, peaches, bags and bags of fruits soaked in (what else?) more rum, and my lord, is this thing ever deep and full-bodied, inviting one ever deeper into the glass (for the record, I probably spent two hours on it). If I had anything cautionary (or negative) to say about the rum, it’s that (a) it needed to be stronger (b) it was not overly complex in spite of the flavours described above and (c) no matter how hard I tried, I could not rid myself of the suspicion that it had been tarted up some, perhaps with caramel, perhaps with sugar — it just wasn’t all….there. 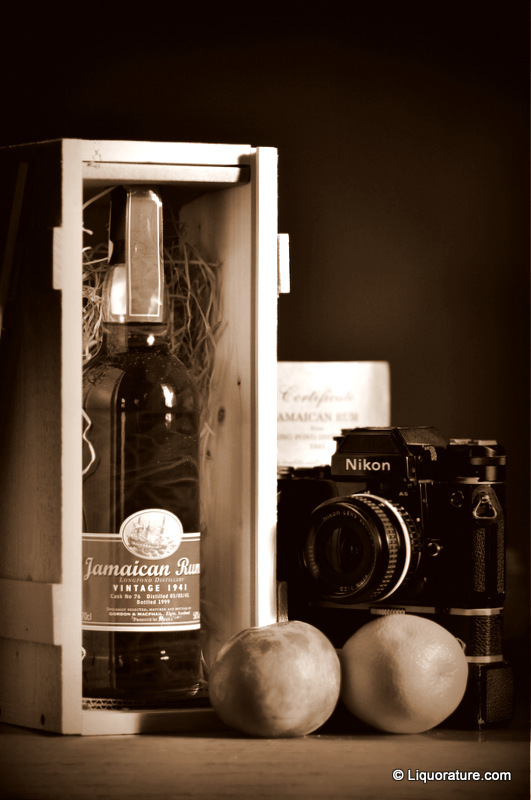 And having had several clean and pure rums from that era, I think it’s possible, though proof is lacking in this matter – it’s just my thinking based on the profile and the comparators on the table back then (note that G&M’s 1971 version of a similar rum has been tested with 19 g/L of additives, so the suspicion is not as out to lunch as it might appear). 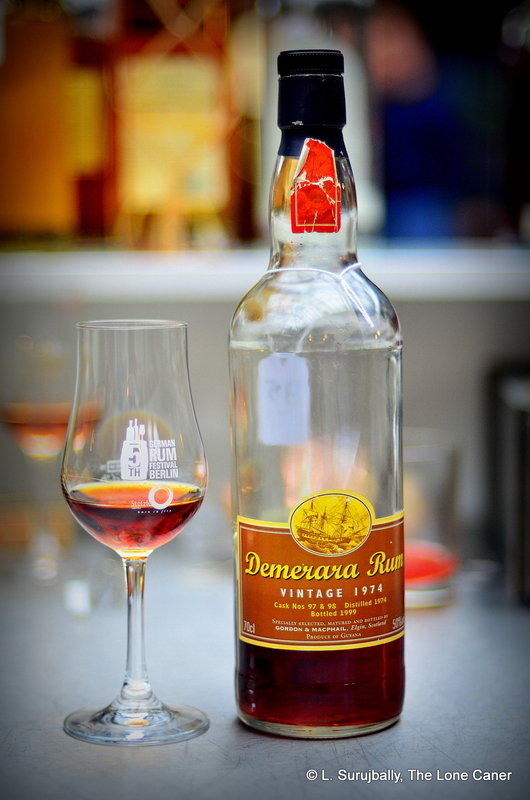 At the end of it all, even where it falters, the Demerara 1974 does not really fail. It really is a very good product and might even cause DDL a few sleepness nights here or there, because it shows up the massively oversugared messes of their own 25 year olds (1980 and 1986 editions both), without ever needing to go over the top in that direction. I haven’t got clue which still made the rum, or whether it was adulterated, but frankly, my dear, I don’t give a damn, because it’s somehow, in spite of all that, still a rum to savour on a cold night anywhere, and if I had more coin in my pocket the day I met it and exchanged kisses, you could be sure I would never have been satisfied with the little I managed to get.